As a tale of lovestruck Italian nobles, some may mistake “Much Ado About Nothing” for one of the bard’s lighter plays -- but remember things are not always as they seem. Seoul Shakespeare Company’s annual main stage production is stuffed with acting robust enough to go beyond frivolity -- doing justice to a script that, while never short on wit, travels from love to sterner matters of shame, honor and death. Young count Claudio loves the fair Hero, while sharp-tongued Beatrice and Benedick swear they’ll never woo. Add two meddling princes to stir up a quick-witted comedy of intrigue with a side of song. Jamie Horan’s urbane Benedick squeezes the last laughs from every line and then some with apt delivery right on cue, and SSC’s artistic director Lauren Ash-Morgan is as adaptable as ever as a fun but fierce Beatrice in the lovers’ merry war of words. Charles Jeong -- always a delight to watch -- is a Claudio so gauche and green that he raises guffaws well beyond the script. Likewise, Heather Moore is poised to make the less-than-verbose Hero resonate beyond her relatively sparse lines. Her visible trembling during her shaming scene -- paired with Lorne Oliver’s stern father Leonato, adds emotional honesty to this comic play’s tragic hue. The low point in the lovers’ luck in Act 5 was also the moment where the production’s dramatic tension lagged most. Claudio’s unwitting joviality in contrast to Benedick’s fighting talk after the shaming of Hero somehow fails to pack the punch it deserves. A shame as both actors show they are capable elsewhere. But it was a minor blip in an otherwise smartly paced production. While S. Vollie Osborne as Prince Pedro dons disguises to play cupid, Chris Zaczek’s villainous laugh goes as high as the rafters as his meddling brother John. Talent is also strong in minor roles -- Kim Hyman’s saucy Margaret and Jason Cutler’s swaggering dude-bro Borachio shows how SSC makes characters their own -- allowing age-old themes of love and deceit to be relevant today. Shakespeare’s antiquated English can challenge even native English speakers, but SSC makes the language as accessible as possible with emphatic delivery, generous gesturing and appropriate personalization of lines. Unlike many of Shakespeare’s other plays, there is no magic nor hands of fate to drive the action in “Much Ado” -- and the stage is bare, as it would have been in Elizabethan times. But under the direction of Michael Downey, these expat regulars to the Seoul stage stuff 16th-century quips and quarrels with enough character to burst the seams of their bodices and breeches. 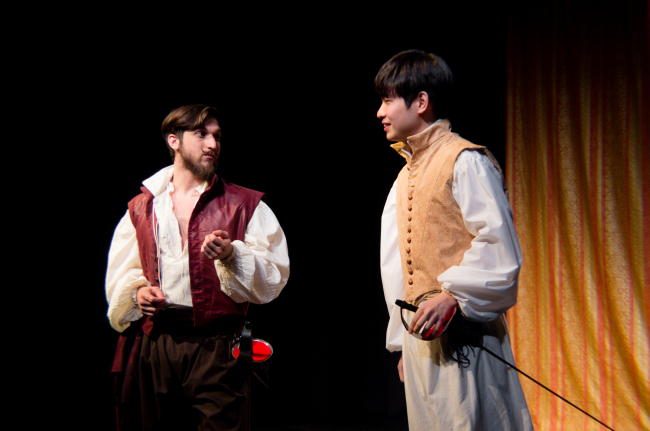 William Shakespeare’s “Much Ado About Nothing” will play at Theater Egg and Nucleus in Hyehwa, Seoul, until June 5. Talkbacks with the cast and director will be held after the 2 p.m. show on Saturday and the 4 p.m. show on Sunday. The play is performed in English with Korean subtitles. More details can be found at: www.seoulshakespearecompany.org.